Learn about their positions on redistricting legislation, commonsense gun laws, medical marijuana, proposed "fetal heartbeat" legislation to restrict abortions to as early as six weeks, workforce and affordable housing, education reform, and more! 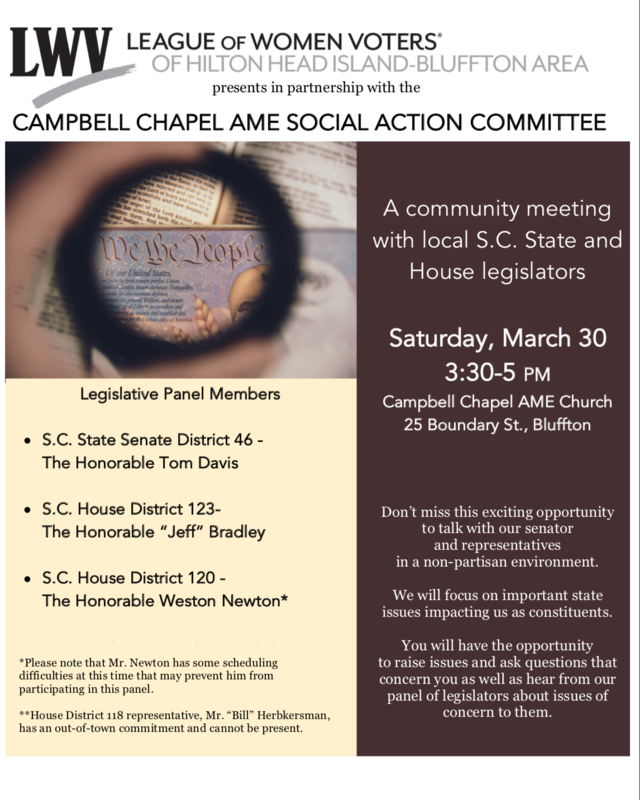 This non-partisan community meeting was co-sponsored by the League of Women Voters of Hilton Head Island and the Campbell Chapel AME Social Action Committee. About 3:30 p.m. on Saturday, March 30, some 60 people gathered in the Campbell Chapel AME Church to hear from and ask questions of local elected officials. MaryAnn Bromley, State Issues/Advocacy Committee Chair of the League of Women Voters of Hilton Head Island-Bluffton Area, partnering with Clarice Allen of Campbell Chapel, opened the meeting. S.C. Senator Tom Davis and Beaufort County Councilman Michael Covert of District 7 were introduced. Two state representatives, Weston Newton and Jeff Bradley, had to bow out at the last minute. The Rev. Dr. Jon Black also welcomed everyone. Davis, who has been a state senator since 2009, said he looked at issues on a case-by-case basis. Currently, he is most concerned with the future of nuclear facilities in the state, money for education (particularly teachers' salaries and classroom needs), and access to health care in rural areas. Covert, a local businessman, spoke about current county issues, including the newly hired county administrator who will take up her duties later in April. He believes the upcoming county budget will not require an increase in taxes and hopes instead that it will lower taxes. He reminded the audience that the County Council only has the authority to approve the millage rate to meet the County Board of Education's budget needs. It has no other input to the education budget. Council is working on plans to set up a regional storm water authority and to coordinate with Jasper County to promote the development of affordable housing in the area. Convenience centers are being repurposed to make recycling less of a focus because it is becoming too expensive to process. Curbside pick up is not now being considered. In response to a League question about gerrymandering, Davis said he was behind bills that would set up an independent commission to carry out redistricting. Taking politics out of the process is a good idea, he said. Covert added that the county uses state data to determine the configuration of County Council and Board of Education districts. A comment from the audience called for sensible gun laws, especially to extend the time for background checks. Davis said he supports the background check extension, forfeiture of gun rights for specific reasons, and updating the data base more quickly. Another person called for laws to use marijuana and stem cell therapy to treat certain illnesses. Davis supports using marijuana oil, under the supervision of doctors, for medical purposes. He does not support recreational use of marijuana. He is sure that if the medical marijuana bill is blocked in this legislative session, it will carry over to next year's session. At this point, Davis offered advice on the most persuasive way to advocate for or against an issue. It is through writing a personal letter to him about the issues. If you do that, he will call you and personally discuss the issue. Form letter petitions will get a form letter response. League Co-President Nancy Williams asked Davis if he supported a bill in the legislature that would outlaw abortions after a fetal heartbeat can be detected. Davis said he is pro-life and wants to decrease the number of abortions performed each year. Williams then presented the National League's pro-choice position. The State League's advocacy representative in Columbia believes that the "heartbeat" bill is unconstitutional. Davis said he thinks, if passed, the law would become part of an effort in the various levels of court challenges to overturn Roe v. Wade. Several questions focused on education. Davis agreed that it is a serious issue. S.C. is 24th in the U.S. in per-pupil funding of education; it is 49th in outcomes. Davis believes that not enough funds get into the classroom and teachers' salaries. Too much is allocated to administration. Parents need to be given a choice about where to send their children to school. Competition, in his view, can improve the quality of education offered. Covert feels that poor districts need to receive more equitable funding. Beaufort County gets less money for education from the state than any other county because Beaufort is considered to be a wealthy county. Both Covert and Davis favored promoting technical colleges as good choices for post-high school education. An audience member urged Davis to support laws that would allow "Dreamers" to pay in-state college tuition rates. (They now are charged the out-of-state rate.) Davis said he would consider supporting the effort. In answer to a question about affordable housing, Covert said that having the government build such units would not be a good idea. What government can do is set up an impact fee bank to help private builders finance low-cost housing. Other people brought up curbing predator lending practices and building shelters for the homeless. In closing, Davis said he is committed to making Beaufort and Jasper counties more prosperous. He is also happy being a state senator. Both panelists stayed after the discussion concluded to talk with people about their individual concerns.